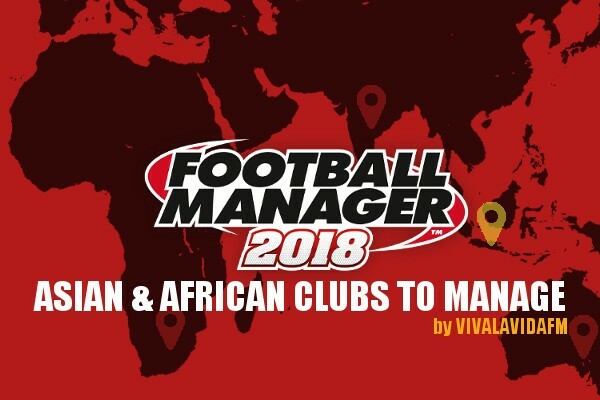 To follow up the success of our latest article looking at the top 10 Football Manager 2018 clubs to manage as we provided some perhaps unconventional recommendations of FM18 clubs worldwide, we’d like to follow up with this guest post from VivaLaVidaFM who hands you his recommendations of FM18 clubs in Asia & Africa to manage. Sometimes I’ll be going about my day-to-day life and suddenly become inspired to take on a specific team in Football Manager. This inspiration leads me to begin to work out how I’ll manage that team before I even load up the game. I’ll plot how I will take down my rivals, I’ll pre-scout potential FM wonderkids and I’ll decide on the players I will be showing the door. This is when Football Manager is at its best for me, when I am truly engrossed in a team/save. Yet sometimes I can be totally uninspired to begin a new journey, unable to think of any club I would like to manage. It is in times like these that I will seek the help of the FM community. This guide offers a look at some of the clubs you should manage in Asia & Africa on Football Manager 2018. Indian football teams have never excelled in the Asian Champions League, with no Indian sides ever making it past the ACL qualifying rounds. Your job is to change that. In their debut season in the I-League, Minerva Punjab finished 9th out of ten teams and only avoided relegation on goal difference. You will need to build on this piece of good fortune and turn Minerva into a dominant force in India. From there, the ACL is your target. Can you be the first person to lead an Indian side to ACL glory? Santos FC are a second-tier club in the South African football divisions. They are the team to represent Africa in this guide, but why? Apart from sharing their name with a very well known Brazilian club, they are former Premier Soccer League champions who have dropped down a division. You will need to help the club return to the top of South African football. From there, can you turn Santos into a CAF Champions League winning club? Santos represent the perfect opportunity for an exciting save in a lesser used country. For those pursuing Pentagon Challenge fame, Santos could be the club to be. China seems to be the place to be in football in recent times. Many top quality footballers have decided to leave the competitive nature of European football to join the less-competitive Chinese Super League. But as more of these foreign stars join, the more competitive the league grows. At Shanghai Shenhua, you will have a formidable strike partnership in Carlos Tevez and Obafemi Martins leading your line. Your job is to win Shanghai their first ever CSL title. Are you the person to be able to lead Tevez, Martins and co to the top of Asian football? This could well be a very fun save. Persija Jakarta play in the Indonesian first tier, named Liga I. They are considered to be one of the most successful sides in Indonesian football with 11 titles to their name. But their last championship came in 2001. Their last before that came in 1979. One title in nearly 40 years is nowhere near enough for Jakarta fans. You’ll need to build your squad to begin to challenge for Indonesian titles once more, before mounting a challenge for continental trophies. Will you manage in Indonesia this year on FM18? Let us know down in the comments which of the Indonesian sides you will be! Johor Darul Ta’zim present themselves as one of the simpler saves within this guide. The Malaysian Premier League outfit have won the league 4 times in a row, asserting their domestic dominance over their fellow Malaysian sides for the best part of this decade. Your job is to win the Asian Champions League. Simple, isn’t it? Well, Malaysia have only ever had one appearance in an ACL final, that being Selangor FA back in the first ever edition of the tournament in 1967. Perhaps not so simple then! Can you take Johor Darul Ta’zim to the top of Asian football? There will be several tough teams to overcome along the way. R&F Hong Kong are a satellite team for Chinese Super League side Guangzhou R&F. The club were founded as recently as 2016 and currently compete in the top tier of Hong Kong football. They present an interesting challenge in FM18 due to their transfer rules. They are permitted only three foreign players with the majority of their players coming from their Chinese affiliates Under 19’s side. Your job? Take the Hong Kong league by storm! Try to use your affiliates to your advantage! Their youngsters will often be better than most Hong Kong newgens. If you can nurture them perhaps they will form the spine of your side for years to come! Incredibly, Seongnam FC were relegated to the second tier of South Korean football last season. They lost to Gangwon FC in the relegation playoff and will now try to fight their way back up to the top flight. The club remain the most successful South Korean side, winning 7 domestic titles AND two Asian Champions Leagues, the most recent of these being in 2010. Seongnam are on the lookout for an ambitious manager, can you fill that role? How long will it take for you to get Seongnam back to the K League Classic to take back their crown? Possibly my favourite challenge in this post lies with Albirex Niigata in Singapore. They are the second satellite side of this article (after R+F Hong Kong) as their players come from Japanese side Niigata. In 2016 Niigata managed the unthinkable in winning the domestic treble. The league title was their first title since their formation in 2004. Unfortunately, there will be no chance for continental success with Niigata as foreign-based Singaporean clubs are not permitted to enter the ACL. With Albirex comes the potential for managing the Japanese national side. Can you use your Singaporean side to bolster the strength of your national side? This could add a very fun element to your club save. Make sure when you create your game to load all players from Japan. This will mean that you should get a constant flow of newgens into your team (fingers crossed for a Shunsuke Nakamura newgen). Our final club in this Who to Manage post sees us fly to New South Wales in Australia where Newcastle Jets are based. The club were formed in 2000 and have 1 Australia A-League title to their name, having won the competition back in 2008. However they did not finish top of the league in that year, instead winning the league through the Grand Final that occurs at the end of the season. The Jets have struggled of late, finishing no higher than 6th since their league win in 2008. Your immediate job is to turn around the clubs fortunes and start to be more competitive in the league. Longer term, the ACL must be within your sights. Let me know down in the comments who you will start as in Football Manager 2018. I hope you enjoyed the post!